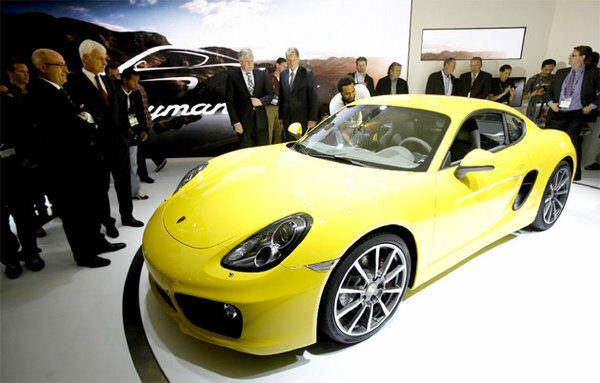 This is possibly the biggest reveal at this week’s 2012 LA Auto Show: it’s the new 2013 Porsche Cayman. 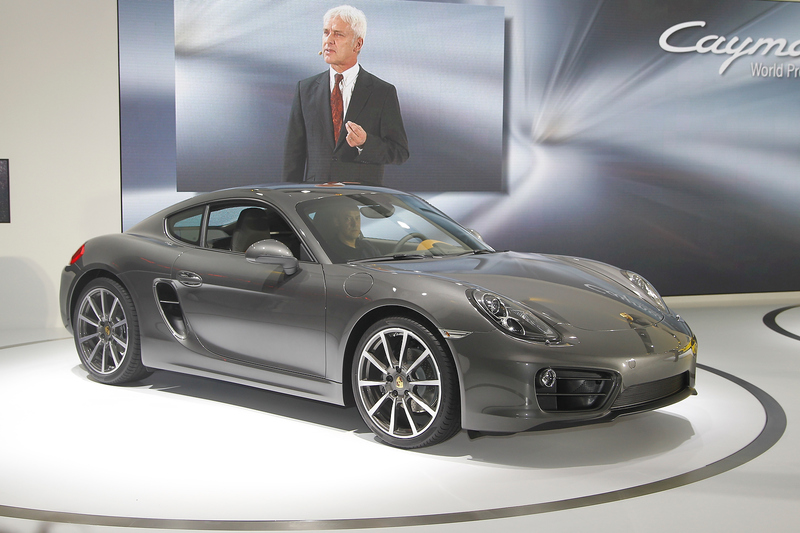 Updated looks bring it bang up to date, while a revised chassis and engine range should mean the new 2013 Porsche Cayman picks up where the old car left off. Still want that Audi TT or BMW Z4? Porsche’s new design language seen on the Porsche Boxster has been carried over to the latest Porsche Cayman – it looks good. Taut and aggressive, but not over the top, yet still flowing and well proportioned. Porsche evolutionary design strikes again. The muscular mid-section houses a 275hp 2.7-litre flat-six in the cooking Porsche Cayman, or a 325hp 3.4-litre engine of the same configuration in the S model. This means strong performance. The entry-level variant will complete the 0-62mph sprint in 5.7 seconds, while the more powerful Porsche Cayman S will crack the same challenge in 4.9 seconds. A six-speed manual gearbox will be standard fit on all engines, while a seven-speed dual-clutch “PDK” transmission will be offered as an option. Speccing the latter cuts the 0-62mph time to 5.6 and 4.7 seconds for the 2.7- and 3.4-litre engines respectively. Top speed now stands at 176mph in the S. Steel brakes are fitted as standard, but for extra bite in shrugging off the easily attainable three figure speeds Porsche is offering a Ceramic Composite Brake upgrade. Six-piston calipers clamp 350mm discs all-round. 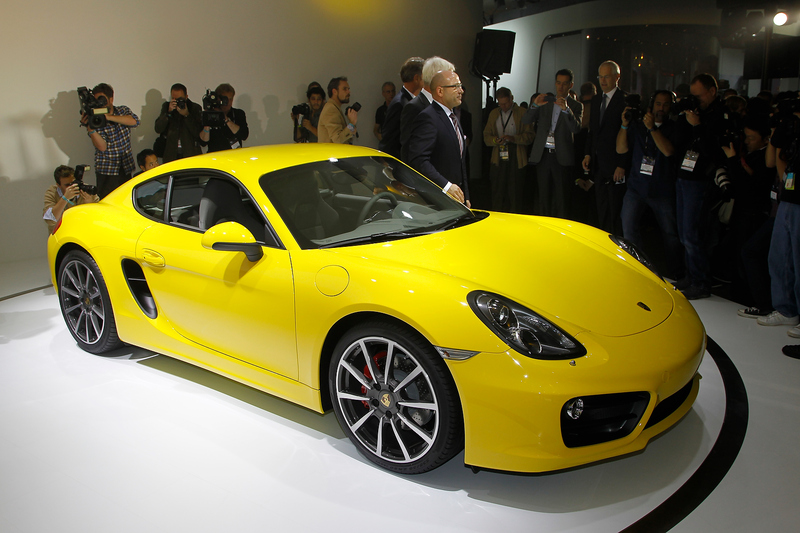 The outgoing base Porsche Cayman’s 265hp 2.9-litre engine has been downsized to 2.7-litres in the new vehicle. Despite making 10hp more, it is also more efficient, returning a best of 36.7mpg combined with 180g/km CO2 emissions, compared to its predecessor’s 31mpg with 214g/km CO2 effort. 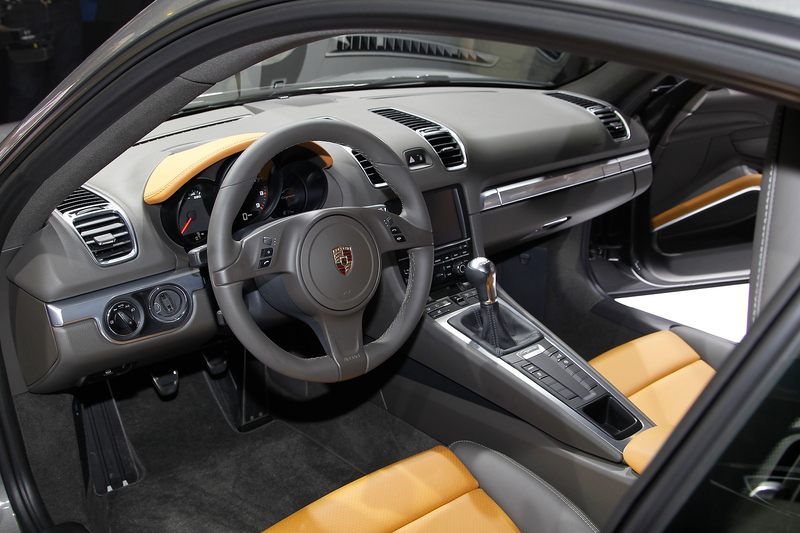 The new car is 15% more efficient thanks to new, more frugal direct injection engines and Porsche’s “thermal management, electrical system recuperation and stop-start function.” The recuperation system charges the car’s battery while on the brakes, turning kinetic energy into electrical power, reducing load on the alternator and engine. The new car inherits the latest Boxster’s interior layout and improves on the outgoing Porsche Cayman’s cabin with a more ergonomic design. Standard equipment includes air conditioning, a seven-inch touchscreen, automatic headlights and 18-inch alloy wheels, while S specification adds larger 19-inch wheels, a partial leather interior and Xenon headlights. The latest Porsche 911 ushered in a new era for Porsche with its electro-mechanical power steering system. 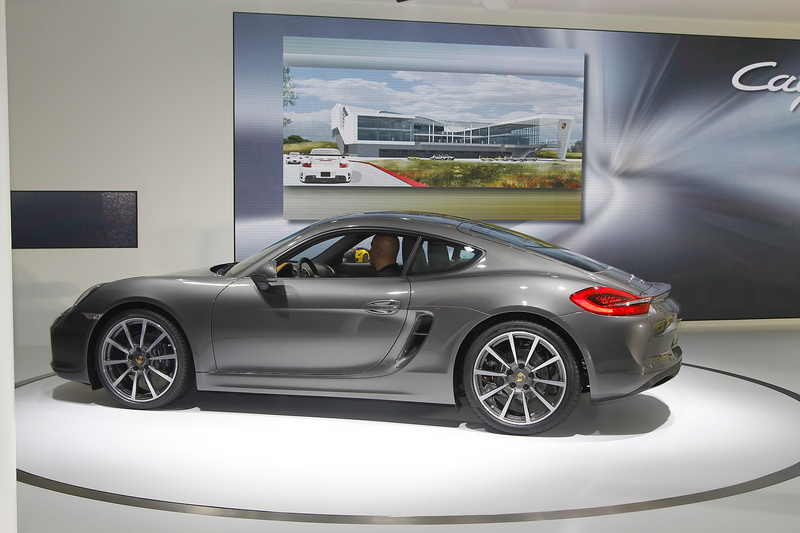 The new 2013 Porsche Cayman adopts the same technology as the firm’s halo model, dropping the hydraulic assistance for its steering and. A contentious issue for the “purist”, but it’s here to stay. Clever tech on the new car includes Porsche Torque Vectoring. Offered in conjunction with a limited-slip differential, the system applies the brake to an inside rear wheel when entering a corner, sending greater drive to the outside wheel. 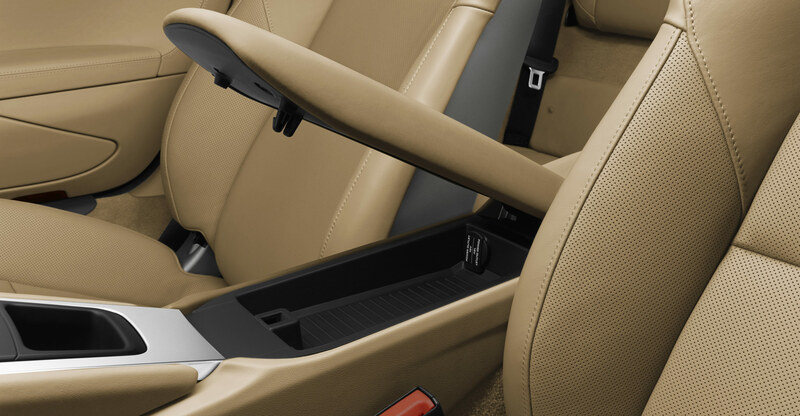 Together, this gives better corner entry and greater stability, according to Porsche. Porsche has revised its Active Suspension Management system for the latest Porsche Cayman, selectable between ‘Normal’ mode for comfortable cruising and ‘Sport’ mode for a spirited B-road blast. Adaptive Cruise Control is also available as an option, too, while Porsche’s Active Safe autonomous braking system will help avoid or mitigate the impacts of a collision at lower speeds. The new 2013 Porsche Cayman features the usual crop of safety systems. It gets Porsche’s Stability Management control, incorporating an automatic braking function to help traction in slippy conditions, and anti-slip regulation to keep wheelspin to a minimum. The new 2013 Porsche Cayman will go on sale in March 2013. Pricing hasn’t been announced, but based on the current Boxster’s asking price, budget at least $54,000 for the base Cayman (including destination) and $64,000 for the Cayman S.